Now in its 20th year, Canada's Walk of Fame has unveiled its list of 2018 inductees. Leonard Cohen will be inducted as this year's "Legend Inductee," honoured for his lifetime's output of poetry, music and novels. Fellow Canadian singer-songwriter Andy Kim will also be inducted this year. He is best known for hit songs like "Sugar Sugar" and "Rock Me Gently." On the funnier side of things, Seth Rogen and his creative partner Evan Goldberg are receiving the same honour. The pair have been friends since childhood, and have worked together on projects like Superbad and Sausage Party. 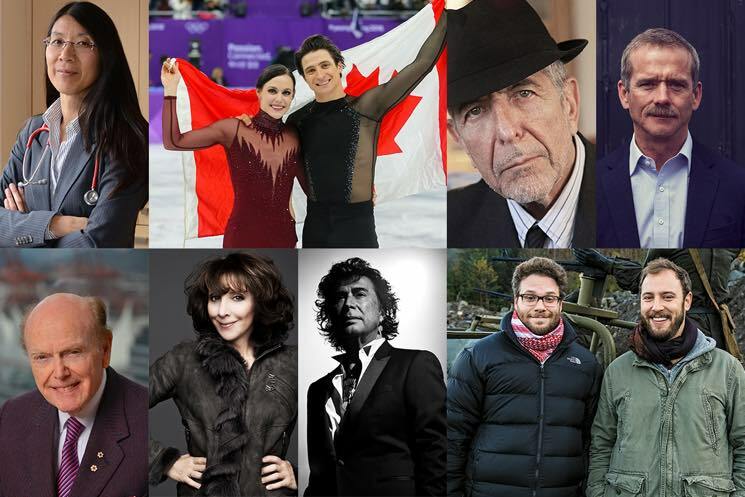 The remaining 2018 nominees are Canada's figure-skating sweethearts and gold medal Olympians Tessa Scott and Scott Moir; Tony and Emmy Award-winning actress, singer, author and comedian Andrea Martin; Canadian spaceman Col. Chris Hadfield; international president of Doctors Without Borders Dr. Joanne Liu; and entrepreneur, investor and philanthropist Jimmy Pattison. Canada's Walk of Fame honours individuals across the fields of Sports and Athletics, Philanthropy and Humanities, Arts and Entertainment, Business and Entrepreneurship, and Science and Technology. This year's new additions will be toasted at an awards show on December 1 at the Sony Centre in Toronto. The ceremony will be broadcast on CTV. Seth Rogen Mocks Kathie Lee Gifford on Live Television over the Meaning of "Escrow"
The Vancouver Aquarium's New Octopus Is Being Named "Ceph Rogen"